Image Size: 9" x 6" Framed Size: 14" x 11" The first siding west of Jasper, Alberta is at Wynd, mileage 2.6 Albreda subdivision. 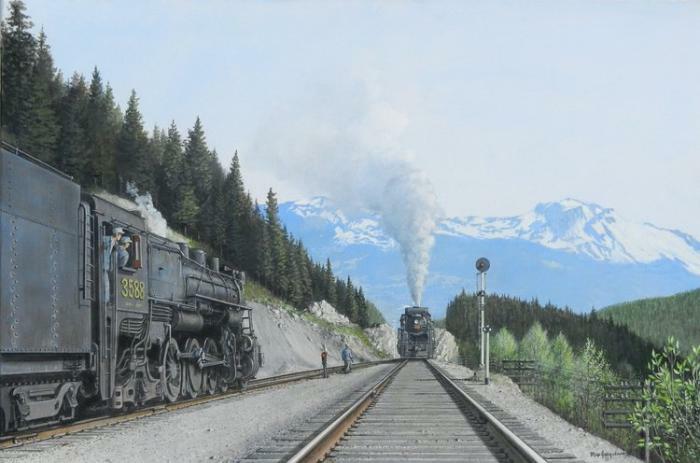 On a spring afternoon the engine crew of S-2a 3588 watch the approach of a westbound freight drawn by T-4b 4321 as it works uprade towards Yellowhead pass. The head end brakeman can be seen walking down to re-align the switch allowing the eastbound freight to re-enter the mainline after the passage of the westbound.